The funds raised support Leukemia & Lymphoma Society of Palm Beach area chapter in advocating lifesaving treatments and cancer research. 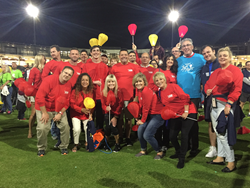 Gilbane Building Company joined as a team to participate in the Light the Night Palm Beach event. The team raised an impressive $31,000 for the local chapter. The event raises funds and awareness for the Leukemia & Lymphoma Society and provides patient support services, advocating for lifesaving treatments and pioneering the cancer research or those whose lives are touched by leukemia, lymphoma, Hodgkin’s lymphoma and myeloma. “The money that is raised at the LLS events such as this one, Light the Night, goes a long way to help generate much needed funds and build awareness for patients with rare blood cancers like me,” Mike Bird, area manager said. “Our team is proud to be here walking with the community to end cancer." Gilbane employees from the Jupiter office and their friends, family members and business associates joined in the walk with illuminated lanterns celebrating survivors and remembering those who have passed. The walk, held at the Ballpark of the Palm Beaches, also included a presentation by Mike Bird, area manager for Gilbane Building Company. Having Chronic Lymphocytic Leukemia, Bird understands the struggle for those diagnosed with Leukemia or Lymphoma and what they go through during their recovery. Bird will serve as corporate chairperson of the walk in 2018. The Leukemia & Lymphoma Society (LLS) is the world's largest voluntary health agency dedicated to blood cancer. LLS exists to find cures and ensure access to treatments for blood cancer patients. LLS funds lifesaving blood cancer research around the world and provides free information and support services to patients, survivors, families and healthcare professionals. Gilbane provides a full slate of construction and facilities-related services – from pre-construction planning and integrated consulting capabilities to comprehensive construction management, close-out and facility management services – for clients across various markets. Founded in 1873 and still a privately held, family-owned company, Gilbane has 48 office locations around the world. For more information, visit http://www.gilbaneco.com.